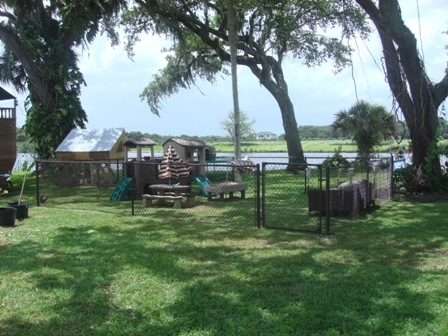 Our yard was beautiful before we started our garden. It was simple. I started noticing that we weren’t going outside much. We would go outside to play a game or two, but even that happened less and less. 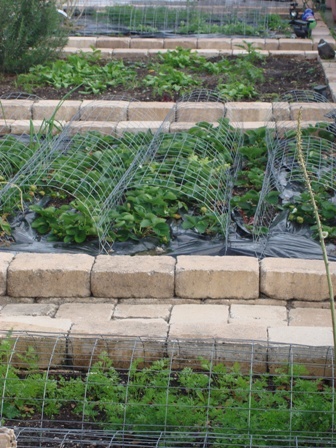 I started a small vegetable garden and realized that we were going outside all the time to look at the garden. 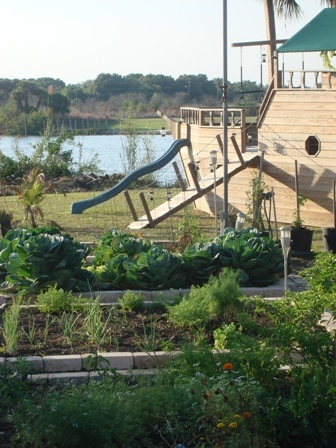 It wasn’t long before we turned the small vegetable garden into a large garden…and every year we make it larger. We go outside every single day now. Sometimes we spend the entire day outside enjoying our yard. 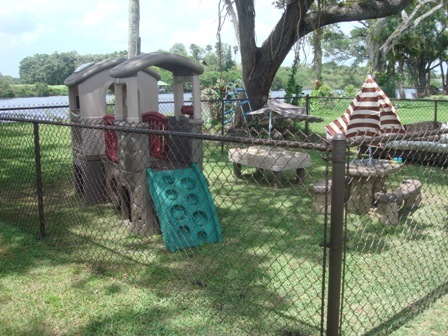 Last summer we fenced in a large area with chain-link for our toddler. We wanted her to be able to play outside while we worked in the garden. We are able to keep an eye on her and know she is safe, yet we are still be able to pull weeds. Now that she is a little older, she is helping us pull weeds. 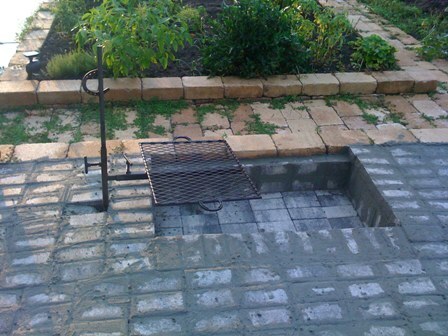 Last summer I also made a barbeque pit. I envisioned the family sitting around it while I cooked our dinner over the fire. 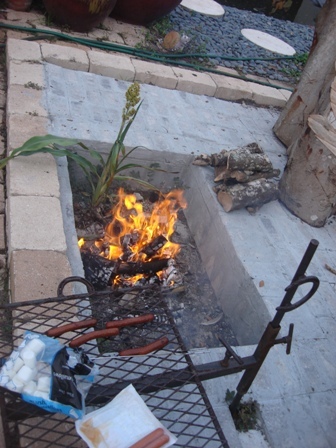 My husband was irritated that I sacrificed one of our garden beds for the barbeque pit when I made it. He got over it when he realized how much we used it over the past winter. We cooked a ton of marshmallows, hot dogs, and beans over the fire while we told stories. The kids love it. I do a lot of gardening in containers. The black pots in the picture below are my favorite. They are big but they don’t get too heavy. They are made of plastic which is light and retains moisture. 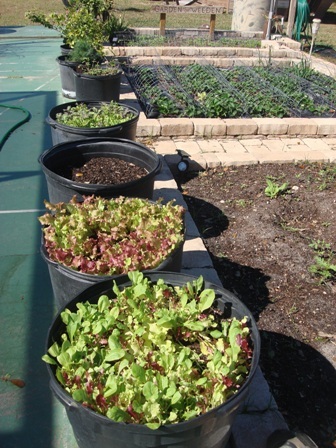 I can move them around easier than heavy ceramic pots and the black color keeps the soil warmer in the winter. However, I’ve decided that I don’t like the look of the black plastic and I am currently working on a new look. 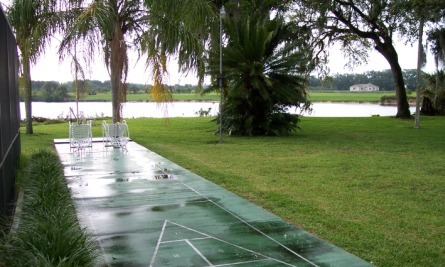 I’m going to paint them a natural green to blend in better with the surroundings and not stand out so much. I tend to move them around a lot and “re-decorate”. 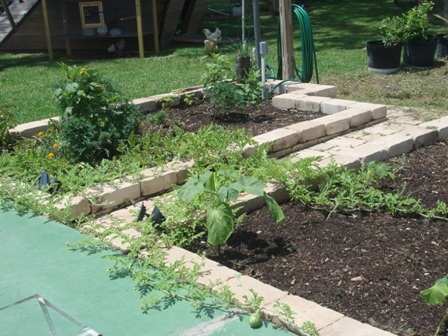 Our garden has transformed over the course of many years. It is always changing and we are always learning. We love to play chess here. I had Grayson help me build the chess board with concrete pavers and paint. 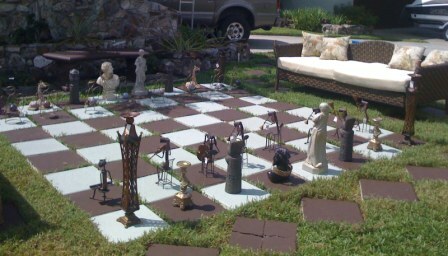 We collected the chess pieces from various discount stores. I taught Grayson how to play chess and now I rarely win a game against him. This ship playground has brought my children many, many hours of sheer joy. We added solar lights all over it that look like antique lanterns. It looks like a Disney World pirate ship at night. We’ve got solar lights in the garden beds that flicker to look like candles. The effect is very pleasing. There are several other assorted solar lights to up-light some small trees and light up the walkways. We find it difficult to leave our yard now. We would rather stay home than go anywhere else. 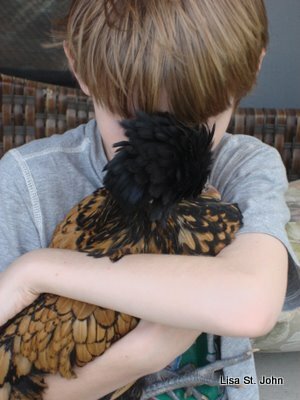 Our perfect weekend is when we don’t have to go anywhere and we can just go outside to play in our yard with our animals and enjoy our garden. 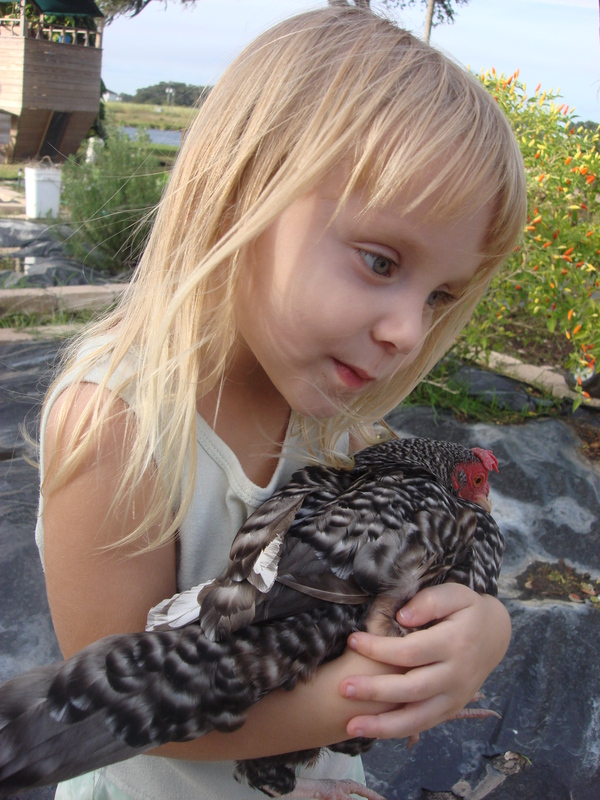 This is my daughter Loring and her favorite chicken “Sweetpea”. It is definitely mutual. Loring is her person. She always lets Loring pick her up and wants to be snuggled. Funny how they are both the smallest and both rule their coops. Hello…we can’t come to the phone right now ’cause we’re outside in the garden. Hello! My name is Lisa. Welcome to my blog. 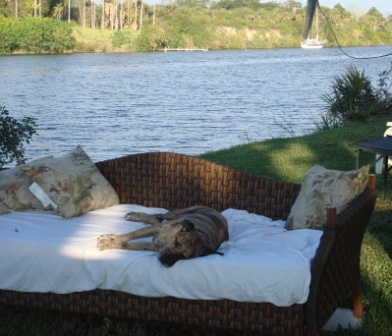 My family lives on 3 acres in Southwest Florida. About 4 years ago we decided that we were tired of mowing our lawn. 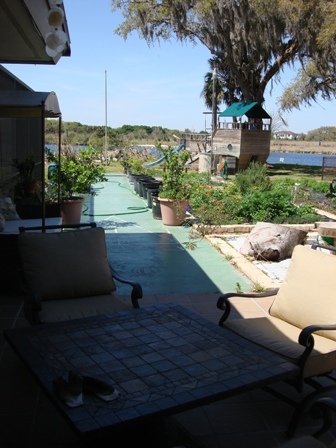 We have gradually been turning our lawn into an outdoor living room with food and animals. Now we spend much more time outside in our yard. I realize that I will never know everything there is to know about gardening. We learn so much everyday. 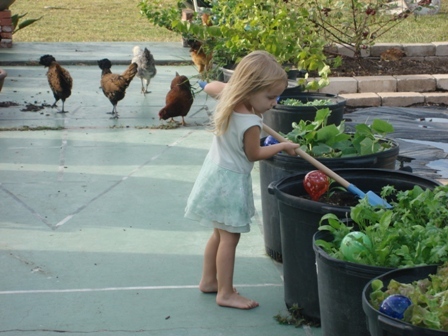 Gardening is something we love learning about together as a family. Our lives are so hectic. Gardening brings us together to slow down and smell the flowers… and then maybe eat them. My goal is to inspire you to do the same. I have so much to share with you. It is a soulful journey.